Among all the topics that seem to rile journalists and publishers these days, perhaps the most contentious is curation. Is summarizing and linking to another person’s article an honorable act or a form of theft? How can you distinguish between good curation and bad curation? Let me begin to answer those questions by summarizing and linking to Rex Hammock’s post last week on this very issue. Hammock’s guideline for avoiding this fix seems pretty clear: If you can’t add value to a story, just link to it. Perhaps not so clear is how to add value. I think most rational people would agree with him that many Huffington Post or Business Insider stories are really just rewrites. But short of that extreme, there’s plenty of disagreement. The best recent example, perhaps, comes from Kashmir Hill’s Forbes.com story last February recapping Charles Duhigg’s New York Times article on consumer marketing and data mining. As Mathew Ingram wrote, opinion was sharply divided over whether Hill stole Duhigg’s story “in an attempt to get pageviews from someone else’s work” or whether she instead served a valuable function in highlighting and directing readers to his article. When I read Hill’s story, I don’t see an attempt to get pageviews. What I see, rather, is someone who is intensely interested in Duhigg’s subject matter, admiring of his work, and intellectually engaged with his ideas. I can’t find similar motivations in the pedestrian article Hammock criticizes. It’s simply the output of an aggregation serf. The contrast between these two attempts at curation suggests to me a test that any writer should apply before blogging about another person’s story: Are you are genuinely engaged with it? If the answer is yes, chances are good you will add value in passing it along. It’s somewhat sad, I suppose, that my only effective mode of self-improvement is to set arbitrary goals. But it works. Last November, I challenged myself to write a blog post a day. I am happy to say I met my goal. Although I subsequently fell off the wagon in December (8 posts) and January (5 posts), it still feels like a significant achievement. This month, I’m setting my sights on Twitter. I think of myself as an active and enthusiastic user of the platform, but when I actually calculate my daily tweets, the number is unimpressive. A visit to How Often Do You Tweet? tells me that I’m averaging 0.7 tweets a day. That ties me with the estimable Paul Conley, but leaves me well behind even the moderate output of new-media mavens Rex Hammock (7.0) and Adam Tinworth (7.6). And if I can trust the MediaPost claim that average Twitter users tweet 0.5 times a day, that makes me only slightly better than average. Now, to be fair to myself, I rarely used Twitter for the first year or so after joining in April 2008. How Often Do You Tweet? calculates your daily average by dividing your total number of tweets by the total number of days since joining Twitter. But even calculating my output for the last six months yields just 1.4 tweets per day. Clearly, that’s not enough if I want to consider myself a genuine participant in the conversation. But how many daily tweets is enough? Realistically, I will never hit that level. It’s just not in me. But 10 tweets a day should be doable. I’m not sure one’s number of followers is a good proxy for effective use of Twitter, but let’s assume that it is. If I tweet at least 10 times per day, how many more followers will I have, I wonder? My count as of February 1 is 255. Let’s see where I end up on leap day. Retweets and @replies count toward my daily goal; direct messages do not. Twitter’s not strictly about originality or broadcasting, but about sharing. If the world can see it, it counts; if not, it doesn’t. Exactly three of my tweets must be self-promotional. I want to follow my formula of one-third of my daily tweets being conversational, one-third curatorial, and one-third promotional. For me, the last of these quotas is the biggest challenge; not, as for many others, because I need to cut down on promotion, but rather because I need to increase it. Marketing does not come naturally to me. Escape clause: One day a week, I can make up any deficit for the previous six days (but by no more than 10 tweets total). I hope I won’t have to exercise this one, but realistically, I probably will. Defining “activity” by messages “sent” is misleading. Twitter is also for receiving messages. In fact, much of what counts in the media world is concerned with receiving messages, not sending them. No one holds YouTube to the same standard as Twitter, so it seems unfair to focus on messages being sent. Back in the late 90s or early aughts, one of the hot topics in the Web 1.0 world was personalization. On the industry portal site I ran for much of that time, we had what seems now like a pretty lame concept of personalization. We wanted to let our registered users select their interests from a predetermined set of categories, then present a customized home page when they logged in. We never implemented our plan, but it hardly mattered. The onset of Web 2.0 and social media, along with the impact of Google search, would have rendered our efforts irrelevant. But the need for publishers to think about how to make media more personal is, if anything, more important now than ever. There are many ways to go about that, but here are three that should be at the top of every publisher’s list for consideration. 1. Aggregate. Personalization means giving readers the information they want. And they don’t just want your own, original information—they want all the relevant content they can find, regardless of where it comes from. So you must point them to it by identifying and aggregating good content from other sites—even from competitive sites. 2. Treat your editors and other content creators as publishers. The old editor-in-chief, top-down, command-and-control approach to managing a content team doesn’t work in an era of personalized content. To make your content more personal, you have to empowever every person on your staff and give them a bigger role in deciding what content to create and curate. You need to encourage and promote their Twitter accounts and other social media outlets, even at the risk of allowing their personal brand to outshine your own media brand. 3. Treat the readers as your staff. The people formerly known as the audience aren’t just your readers anymore. They are participants in creating and disseminating your content. They are in some ways functionally indistinguishable from your own editors and reporters. In practical terms, this strategy means encouraging and responding to comments and highlighting them when appropriate, offering readers platforms for their work (as the Huffington Post has done for its commenters), and even perhaps hiring them are fully-fledged, paid staff. As I’ve suggested, these three tactics are neither the only nor the required ways to make content more personal. But any publishers who aren’t thinking hard about how to make media more personal are putting their futures at risk. Back in August, I did an informal study of one B2B publisher’s editorial use of Twitter, and found that most tweets tended to be promotional (linking to in-house sources) rather than curatorial (linking elsewhere) or conversational (engaging with users). Now a Pew Research Center study of 13 mainstream media outlets finds an even more dramatic excess of promotion. The organizations studied included The New York Times, NPR, ABC News, The Huffington Post, and Fox News. 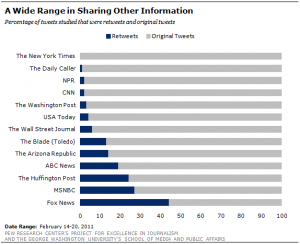 More than 90% of their tweets with links were to their own sources. While only 7% of their tweets linked to outside sources, even fewer were conversational in nature: just 2% asked readers for input, and only 1% were retweets. The causes and implications of these findings have been well covered by Megan Garber, Mathew Ingram, and Ethan Klapper, among others (if I missed other good ones, why not note them in the comments below?). I’ll just add this suggestion: when you tweet, try to balance your pronouns. Make sure you match your I—links to your own stories—with equal measures of they—what others, including your competitors, have said—and you—reacting to and soliciting information from your readers and followers. What is it about aggregation that riles so many journalists? I understand the competitive motives behind the objections of legacy publishers like Rupert Murdoch and the New York Times. They don’t like the idea of anyone “harvesting revenue that might otherwise be directed to the originators of the material,” as Times editor Bill Keller wrote. But why should individual writers, who have much to gain from the exposure aggregation can provide, find it offensive? It takes a little while to unwind the argument of this Tweet, even more gnomic than usual for this ultraconcise medium. I doubt that the writer really objects to the authorized collecting and reprinting of articles: Reader’s Digest popularized that concept nearly a century ago, and until recently, at least, plenty of subscribers seemed to like the idea. More likely the writer was thinking not of legitimate republication, but collecting and reprinting entire articles without permission or payment. That would indeed be distasteful; in fact, it would be theft. But in this respect, few would argue that the Web is any different. You only need to review the online outrage over the swiping of a blog post by Cooks Source last fall to see that. But this is not what aggregation is about. When people talk approvingly of online aggregation and curation, they are referring not to copying, but citation, quotation, and commentary. The practice takes a variety of forms, but straightforward examples include Digg, TechMeme, and B2B Marketing Zone. The nearest print analog would be those dimly remembered volumes in library reference rooms that indexed articles from journals, magazines, and other periodicals. Except perhaps among library scientists, they were never best sellers, but neither were they distasteful. Where the Web is different, of course, and the reason why aggregation has become so popular, is that unlike the print versions, you don’t have to visit your local library, fumble your way through the stacks, and hope you can find the right issue of the magazine with the story you seek. Instead, you simply click on the link and start reading. That is a powerful difference. Any journalist who ignores or deprecates such a useful tool for sharing information with readers is doing them a disservice. It’s honest work that benefits readers and writers alike.